The Stone Age studies of the cycles of sun and moon were the first steps in the creation of time. Callanish in Lewis, Outer Hebrides, is, no doubt one of the most iconic stone circles of the British Isles. The circle itself is rather small but it are the adjacent alignments of stone rows that suggest that something of “heavenly” importance has been going on there. 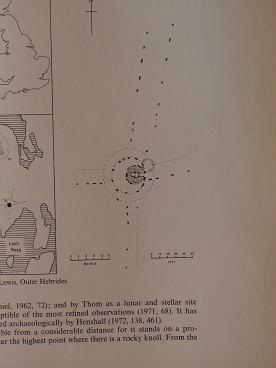 Many astronomers have commented on these alignments and it has ever been deemed the abode of the Hyperboreans by Aubrey Burl (II), whose arguments are better placed in Orkney, which has much additional in high cliffs. Because of all this Callanish is one of the crucial spots in the megalithic culture. Certainly for those who claim this culture had considerable knowledge of the heavens; and of mathematics, as I do. It is of some importance to me to show that also Callanish in it’s measurements conforms to the units of length that I propose, but here the changing data (of Burl) play havoc with my analysis. Since the standard works on stone circles are written by Aubrey Burl, I have nothing else to go on and that is good enough as it is, but for the fact that Burl clearly changes some of his measurement data in the different books he writes on stone circles. This may not be of any consequence for the general reader or archaeologist, who couldn’t care less whether something is 13.1 m or 13.4 m long or distant, but for someone whose arguments rest on the consistency of data, this is at times a nightmare. I use three books by Burl, the Stone Circles of the British Isles (1976, 1986), the Stone Circles of Britain, Ireland and Brittany (2000) and Guide to the Stone Circles (1995, 2000). I call these respectively Burl I, II and III. I feel free to use any of his published measurements, as long as it is unclear why there is a change, because why should the later measurement be better than the former, another surveyor will come with other measures again, but the latest are not necessarily the best and in this case it is usually about decimetres and that is the margin you will nearly always have with regard to stone circles because of the imprecision of the material. The problem in general of these data is that they are practically always based on an average of several single measurements, as it very often happens in science, even when much more precision is required. Because of the inherent vagueness of the precision of the data, which, in the case of the megaliths, has everything to do with the irregularity and the sizes of the stones and are therefore understandably given in decimetres, seldom in centimetres, this vagueness weakens the argument of the one who claims that a specific unit of measurement was used, as I do. In that case it is necessary to provide a host of data and to be able to show similarities and equalities of length in as many instances as possible, which is what I do. In this analysis of the measurements of Callanish I hope to convince the reader by careful attention to the lengths and numbers used, that such analysis points from one site to another and that by doing so the temporal or traditional relationship comes to the fore. It is also an introduction into a possible way the calendar was created and kept update. Probably the first use of plus and minus 1 in arithmetics. The same holds for the architecture of megalithic chambers, which all stand in certain traditions, although they may have considerable unique aspects. It is with architecture much as with pottery, a certain style spreads over a certain area for a certain period, and one does not find that type of pottery or architecture suddenly pop up somewhere at a much later date (except in our time of course). For pottery archaeologists generally adhere to this principle, but when it comes to architecture this rule is not applied, it seems. One of the crucial features of Callanish is, what is called the “intrusive” megalithic chamber, which by design is related to similar chambers on Orkney, which though are rather earlier than the complex at Callanish is usually dated (2850BC) and the chamber would have ‘intruded’ at an even later date. So this could be quite a problem. In my view the chamber is not at all intrusive but the best example of what I have argued, time and again, that the chambers often were refuges and sleeping places for the astronomers working at these sites during the night. The cruciform passage chamber probably stems from central Ireland and has three niches in which a person could sit covered in hides or whatever, with still ample room for a community to gather in the central hall of 3.5m high, corbeled, if need be. As I have argued elsewhere (“Alignments of resilient rock”), stone circles and standing stones attract lightning, so it is important to have a place to shelter once a sudden thunderstorm develops. This is probably the function of the coves we find at several big circles like Avebury and Stanton Drew, and probably at Stenness as well. They protected those who were working there during the night from lightning, wind and rain. Just as it is not advisable to go near trees, when a thunderstorm breaks loose, and certainly not an oak tree which attracts lightning like no other tree, because of the high iron content of its wood (I know this because I was an ash-glaze potter), so it is not advisable to go near standing stones or circles at such a time. To return to Callanish, this complex, in my view, or at least the stone circle with chamber, must have been contemporaneous with early chambers in Orkney, whatever radio-carbon dates come forward, because these are always ambiguous: what is the last one, what the most reliable one? The chamber was not intrusive but built on purpose once the people found out the danger of the lightning in and around standing stone circles. This so-called ‘intrusion’ of chambers is found elsewhere in circles on Lewis. The small chamber is indeed the perfect example of a hide-out for a team of up to 3 cosmologists. Note the third stone in the east row, exactly east of the central pillar, right on the axis of the passage, as foresight for rising stars in the eastern sky or an equinox sunrise. 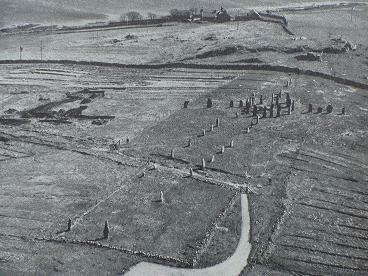 Also note different spacing of stones, as at Brodgar. Lying in the passage one could encadre the rising star in the opening and fix it with one of the stones in the row and record it, or use the gap between the stones as a measure of time or diameters of a rising moon. Measuring all this might give revealing results. The circle of Callanish is an oval of 13 standing stones with a 14th central pillar which at the same time functions as curbstone of the chamber. The fact that the pillar is not at the very centre of the circle suggests the chamber was part of the original design or the pillar was erected at the time the chamber was built within the circle; it stands though in line with the west row of the Avenue. The chamber opens to the east, where sun, moon and stars appear over the horizon. There are several other measurements on the same page of Burl’s first book. One is the Avenue of High Stones (NNE) towards the north of 82.30m, this is exactly 100MY or 82.28m or 200 male tibia bones of 41.14cm. 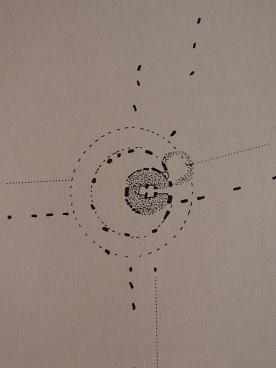 Drawing of the small chamber, Callanish, inside the circle, curbed by the central standing stone. Note alignment slightly east of North, at Skara Brae it is west of North. These data have been superseded by a completely different measure of ENE length of 23.2m, which I can meaningfully relate to 23.04 m = 56 tibia, 56 being a number which occurs in early Stonehenge, Aubrey holes, related to 3 big mooncycles in years. That the earlier data with the later found end-stone less are also meaningful here shows that the, sometimes different spacing of the stones was also with specific purpose, like we find that in Brodgar, the actual number of stones here could be revealing. The length of this South avenue would have been 27.4m (I) or 27.2m (III), which is either 74 fibula (2×37) or 104 ulna (8×13), respectively. Since there are two stone rows, it may have been both. A single row of stones leads West over 12.2m = 33 fibula = 12.22m (BI), but in (BII) it is 9m, then in Burl III it is 13m, which could easily link it to the ulna, 25 x 0.2618 = 13.09m, A.B. Powell’s standard of Newgrange. The numbers employed here are: 13 as shown, 37 and 74 for 2 and 4 lunar long year-cycles, 59, 2 lunar month-cycles, 25 and 100 are Newgrange standards (only Newgrange counts in multiples of 5’s and 10’s, the fingers of the hands, as far as I know, and the Ness now, I nearly forgot) and 43 which I have shown elsewhere (Avebury lunar clockwork, Stenness, Stonehenge) is important in calculating lunar eclipses (eclipse years 2 x 173= 346 days) and numbers of years, like 4 years is 1461 days +1 is 1462 = 2 x 17 x 43 . Alexander Thom called the end of the eclipse cycle of 173 (4×43+1=173) days ‘the danger period’. I have no doubt they were occupied with predicting eclipses. The number 43 occurs in Stenness and Stonehenge. The numbers 9 and 10 are involved in the measure of 3.7m = 9 tibia = 10 fibula and central in the number-logic and geometry. The same numbers recur again and again, because they belong to a way of calculation and of fixing important numbers in the calendar. These numbers were no doubt auspicious because they corresponded to the harmony of Heaven. What I show here is that all these numbers are meaningful in the calendars, and specifically in the counting and placing of numbers (of days) in periods, which is the heart of measuring time. In his guide book (III), Burl states on Callanish: “the puzzle is the tiny chambered tomb……in it cremated bone and late beaker sherds may have belonged to the centuries around 1700 BC”. It seems archaeologists cannot get around to the fact that a church may exist for a thousand years before anybody is buried there, if at all. They just don’t grasp the function of megalithic chambers as refuges, as artificial caves, as places to survive, with the possible exception of those chambers that are built into a burial mount with courts, but even there the shelter and gathering function, or the mystic entrance to the underworld like in some portal chambers, would have been foremost, not the deposition of corpses or bones, that is a side issue, like in churches. The tiny chamber of Callanish is contemporary with the Bookan type of chambers in Orkney and Caithness (northernmost mainland Scotland), these belong to the earlier megalithic buildings, but archaeologists find bones and potsherds of later date plus a chamber built on the rubble upcast from the stone holes and archaeologists sum up and conclude the whole building was an intrusion and built a thousand years later at least than similar buildings elsewhere. Then you have a problem of your own making. It is suggested Callanish had several phases of building, this would at least help explain astral alignments, but I think this complex was built initially at around 3000 BC, the chamber may have been added somewhat later and may have come out a bit bigger than intended, the central pillar would conduct the lightning, it stands in line with the west stone row of the long avenue. Some stone row may have been there from the very beginning, which was the start of a tradition. It may have been used for eclipse prediction for a very long time. It was no doubt a very important Neolithic cosmological center and related to the Boyne Valley and Orkney.